Sunglasses, check. Shorts, check. Sandals, check. Yep, summer has finally hit the UK and boy doesn’t it feel good! There’s nothing like a bit of sunshine to put a smile on everyone’s faces… that an afternoon full of Pimms in a beer garden. So this week, my inspiration came from this little lady who has teamed a cute polka dot shirt (tied off at her midriff naturally) with simple shorts and neautral strappy sandals. I’ll be (trying!) to channel this look whilst dressing for work this week… sadly the office calls, so no lazy afternoons until the weekend boo! I’ve been a bit disappointed with the stuff in the shops at the moment. Probably something to do with the weather – it can’t make up it’s mind what season it want’s to be, which makes it difficult to get dressed in the morning let alone shop! I’ve always been a colder month kinda girl and come September i’ve already got my eye on a winter coat and cosy knits. So when I spotted these in Forever21 I had to knab them. The jumper has cute metallic knitted panels with a hint of sheer fabric so I can ease it in into my wardrobe now… score! 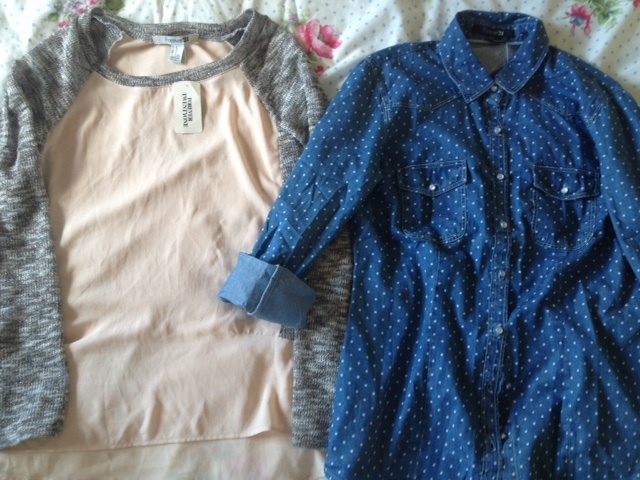 And well that polka dot denim shirt was just too cute to leave behind. I’m a self confessed jean junkie… there I said it. I pretty much live in my skinnies and have them in every colour and wash you could imagine. I love the girl below and how she’s jazzed up her boyfriend jeans with a pale blue shirt and cute bow tie. Adding just the right amount of girliness with a slight heel and showing off her ankles. Perfect.